El Sombrero in English translates to “The Hat.” That’s the name of this restaurant. My sister and I were looking for somewhere to eat, and she said she was tired of pizza. I know she loves Mexican food, so when I saw the symbol of a “hat,” outside this spot, I threw it up as an option. Also, we were freezing our asses off and wanted to get inside somewhere quickly. So El Sombrero it is! This was a very good decision on my part I must say. The food, the service, and the overall experience here was splendid. First and foremost, I must compliment our server, Alejandro. This man was very professional, attentive, and my sister and I both agree, the guy’s a stud. Mind you, that has nothing to do with the food, but it certainly made for a cool experience. Do note, I’m not into dude’s, that’s not my thing. However, I can appreciate a dude who is good looking and emanates sexiness. Alejandro is one of those dudes. Anyway, we ordered some appetizers before our main dish. 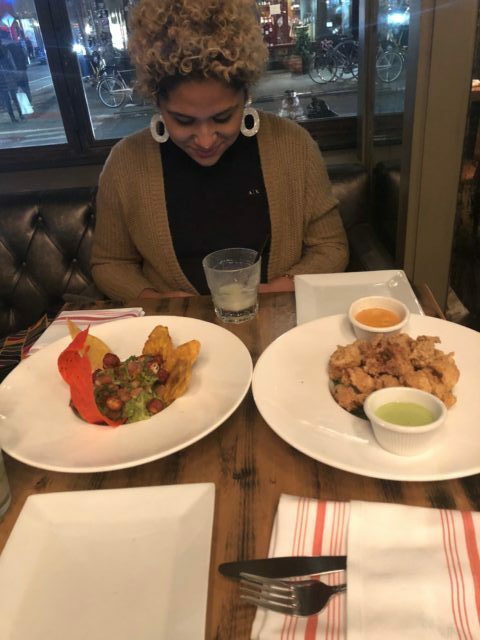 We got this thing called the Sombrero Guacamole and some cornmeal crusted calamari. The two appetizers were both sabrosos! That means delicious. I learned what fried cheese is, and I’m a fan. I love calamari, as does my sister, and they did it right here. Nice and crunchy in all the right places. The sauces were pretty good too. I also happen to love guac, and again, they did it right at this place. We got to eat it with some chips and some tostones. Hmmm. I’m getting hungry! After eating tuna right out of the can the last few days, this sounds so damn delicious right now! 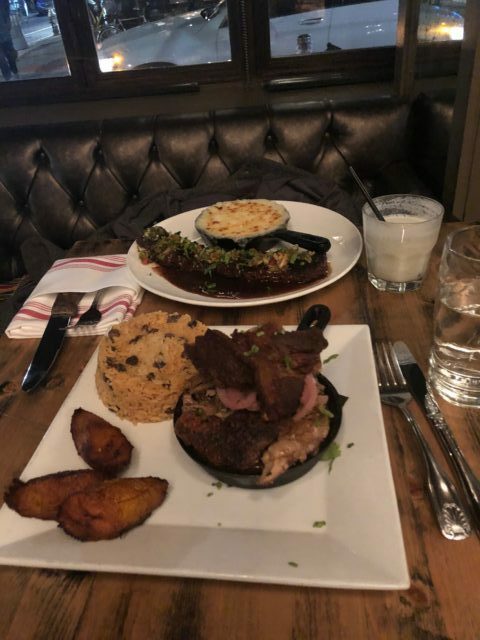 For a main dish, my sister got the steak and mashed yuca, and I went with the pernil and rice. The meats were okay, and I don’t happen to be the biggest fan of pork these days. However, the pernil was on point. The steak was also pretty good. However, nothing that we ate could compare to this damn mashed yuca and cheese dish that she had. Holy crap that was so damn good! It really, really was the MVP for this evening. I had a virgin martini or something, that was okay, but I only had one. Happy hour was on, and they had the drink with alcohol at $5, and mine, which ommitted the alcohol cost me $8.. Bro, what the hell is that? I have less ingredients, and I’m being charged more? Noooooo. Once I realized that, I was like hell no, that’s just straight up stupid. I asked for ginger ale, but they didn’t have any. At that point I decided to shift to water. My experience at this restaurant was very good, aside from the ridiculousness around the virgin drink, everything was pretty good. I’d definitely like to return here sometime. I won’t be ordering any virgin drinks, but the food will make the trip worth it.